It's truly a pain trying to manage email messages across multiple email clients, so why not consolidate everything in a single Outlook inbox? Because it's too difficult and time consuming? Because you don't have a clue where to start? Because you aren't aware of a wonderful little application called Outlook Transfer? Outlook Transfer lets you transfer EML and MSG mail files to Microsoft Outlook quickly and painlessly. Not only does Outlook Transfer port your email messages, it also preserves all attachments, so you'll maintain the integrity of all of your original data during the export. 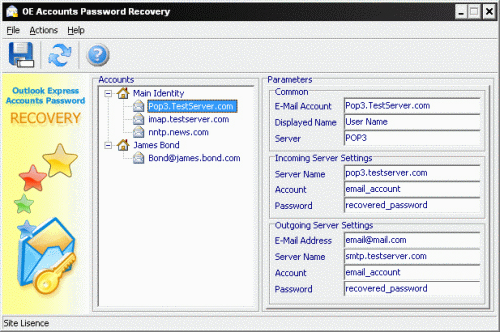 At the end of the day, all of your old email messages are safely imported to your password-protected Outlook PST file! Each of your import sessions is saved as a separate file subfolder by Outlook Transfer, so you never have to worry about overwriting important messages. Plus, Outlook Transfer is fully compatible with Windows operating systems going as far back as Windows 98 (yes, even Windows Me!) and Outlook 98, so you can finally start going through that closet of old PCs and start consolidating your email messages today! 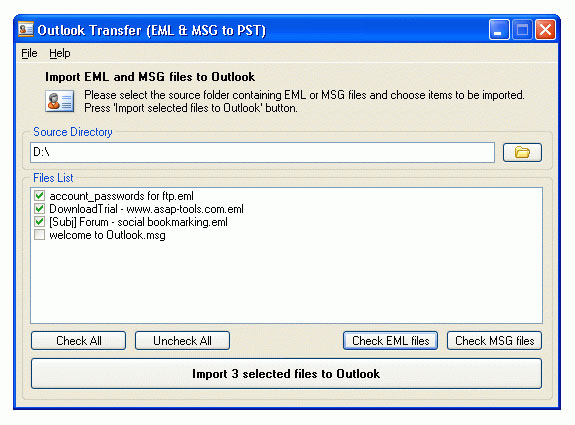 Transfer EML and MSG formatted email messages into Microsoft Outlook. Transfer email file attachments into Microsoft Outlook. Safely import messages without the fear of overwriting earlier imports. “I have been looking for a tool to import my emails to MS Outlook. At last, I have found it at Outlook Transfer author`s website. Well-looking, easy to use and cheap. It does everything I want. Great job!”- Andrew Stew.